Updated with more info on live filters below. Instagram for iPhone has been updated to support iOS 6 and the new iPhone 5, fixing the awkward centering stopgap that we’ve had to deal with for…a whole 4 days now! The new app also adds a brand new ‘registration flow’ for signing users on. As one of my most-used apps on the iPhone, I’m very glad to see it getting iPhone 5 support and (despite my headline) doing it relatively quickly. The update is quite nice, allowing you to see more rows of images in your profile and explore tabs. You’ll notice that the photo view is also no longer truncated, giving you full access to all of the data surrounding your photos. The expanded photo view is lovely too, with more photos on screen at a given time. Sure, it’s scrollable but it demonstrates the larger screen’s usefulness for a grid-type interface. But the capture mode is a tad awkward, as Instagram’s square capture window isn’t really able to take advantage of the larger screen real-estate. Also, curiously, the live filtration options seem to be gone on the iPhone 5 after update to the latest version. We’re not sure if that’s a bug or what. You can see in the screenshot from the iPhone 5 that where the live filter button normally resides sits…nothing. The iPhone 4S seems to retain the button after the update. The new registration flow has more Facebook goodness embedded into it, as you can now grab all of your Facebook info for use in automatically filling out your profile, including picture, email, name and phone number. 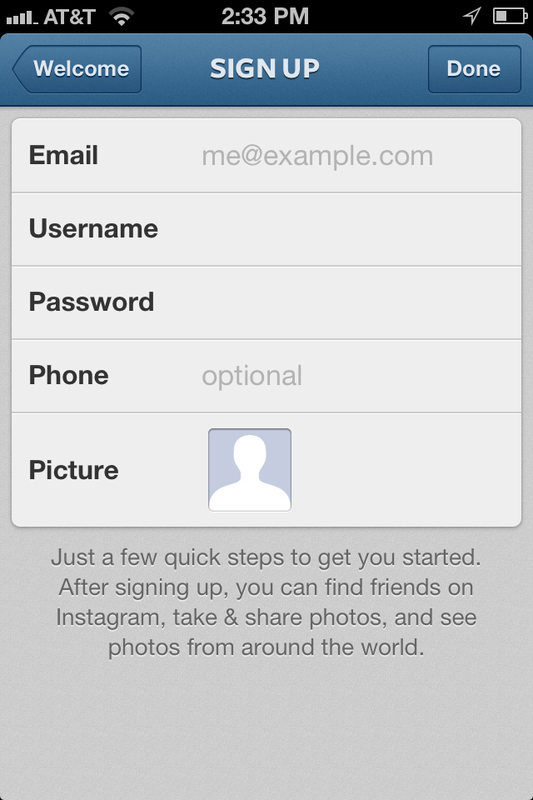 The app still does not offer a Facebook login option, which is interesting. A separate username and password for Instagram alone are still required. The update is about what you’d expect, but executed well. Unlike some apps that simply enlarged their displayed views, Instagram took the time to tweak the interface to work well with the new iPhone. Aside fromt he lack of live filtration on the iPhone 5, which is an odd omission. We’ve reached out to see what might have been the cause of the removal. Instagram says that a version 3.1 update for Android is coming soon. As of the current release (v3.1), Instagram does not support live filters on the iPhone 5. Going forward, live filters will be phased out as we work to improve the Instagram experience for all users. So, for whatever reason, Instagram feels that live filters aren’t a part of the best experience it can provide. And it appears that they’ll be ‘phased out’ in future versions of the app. Still no word on why, but perhaps because they led to a significant portion of app crashes or slowdowns. Either way, you can kiss those goodbye.